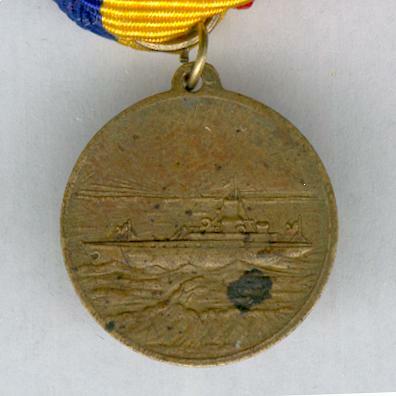 Small circular gilt bronze medal with loop for ribbon suspension; the face with a torpedo boat on a choppy sea with a radiant rising sun beyond; the reverse with a crowned escutcheon inscribed ‘VOCEA POPORULUI VOCEA LUI DUMNEZEU’ (The voice of the people; the voice of our Lord) on a laurel wreath, the date ‘1913’ to the right, the characters ‘50’ and ‘B.’ (perhaps for 50 Ban = half a Lei) to either side of the crown, circumscribed ‘MARŢIŞORUL FLOTEI NAŢIONALE ROMÂNE’ (Martisor of the National Romanian Fleet); gilding worn, oxidisation age marks; diameter 21mm (13/16 inch); on a recent ribbon in the national colours of Romania. 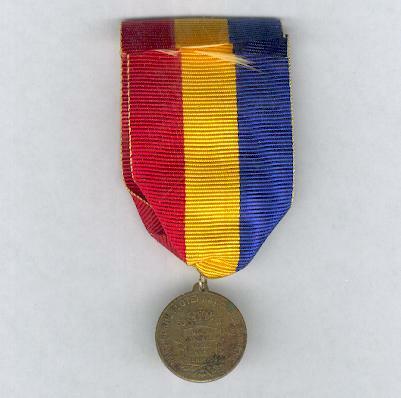 (The original ribbon would probably have been narrow, red and white). 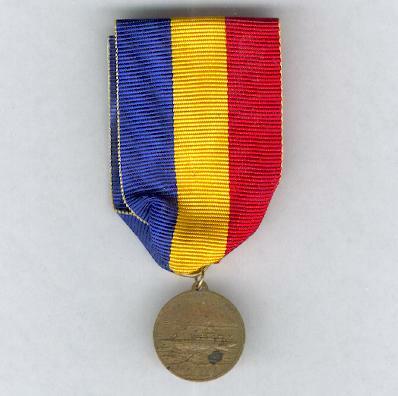 The medal is a ‘martisor’, traditionally offered to loved ones at the start of the month of March (hence the name ‘Martisor’) to mark the hoped-for arrival of Spring and the renewal of life after the dark days of winter. 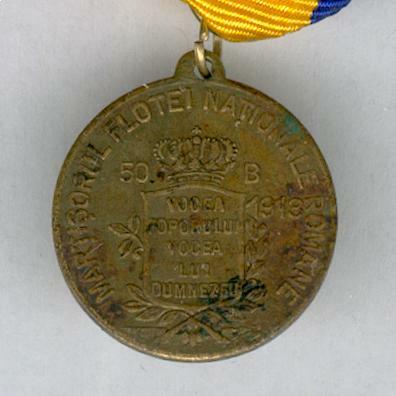 We are grateful to a knowledgeable friend in Romania for information on the purpose of this medal.